hmm... how can I post that as a list? @SilkyShark, just put a hyphen before each list item to display as a list (per Markdown syntax). Have you seen the Dixie Zone race calendar we maintain? It includes Florida swims. Are you interested in helping update it for 2016? Thats better! Thanks! and a great link as well. the dates below are all for 2016. If I find new dates for the swims on your site, I will let you know. I found three more short races. I always like these "shortys" because they are great practice in calming the race adrenaline. Cool, thanks for finding that 5k in Jensen Beach (June). Might have to put that on the calendar for a fun run. Hi, all- I'll be in Miami the end of March and would like to get in a long swim - 12ish miles or so. Is it possible to swim the circumference of the beach? Any other suggestions? I'll have a boat and kayaker. Thank you! All the way around Miami Beach is about 21 miles. Gail Rice and Randy Nutt did it back in 1996, so it's possible, but longer than your target distance. Thanks, Evan. After reviewing several posts, I decided to swim around Key Biscayne and have a boat lined up. It's so helpful to have the hive experience of the forum! Hollywood, Deerfield, Boynton, and Boca beaches used to have a swim series around New Years on consecutive weekends (some on back to back days). Each swim is a mile. Water is typically cool, but loaded with manowar. The ISHOF usually has a mile and/or 5K around the same time of year. Lots of college kids there to beat up on. Slightly off topic, but genuine question - WHY are there no winter swims in FL? Is there some crazy winter current/bad conditions I am unaware of? Are the Manowar mentioned above absolutley everywhere? Because races in 80+ degree water, in the sun, in summer/fall when when the swim schedule is already saturated with races and people have to skip some for conflicts/recovery time etc. make very little sense to me... while having them in December/Jan/Feb would not only be cooler, but also be a great way to fit in big swims when the race calendar is sparse, and help us to have winter goals to keep on track. So what is the reason why winter swims don't happen? Because if there isn't any reason not to (in some areas), I would LOVE it if race organizers would consider some December/Jan/Feb dates! As it is I will never be able to do Alligator Lighthouse, Tampa Bay, or Key West, and I would love to if they were in conditions that wouldn't kill me with heat stroke. Gail Rice might have done this swim as well. One swim to consider is Port Everglades to the Port of Miami. I believe that it's been done once before by Duffy Dillon (current ASCA official), but has been essentially lost to time. 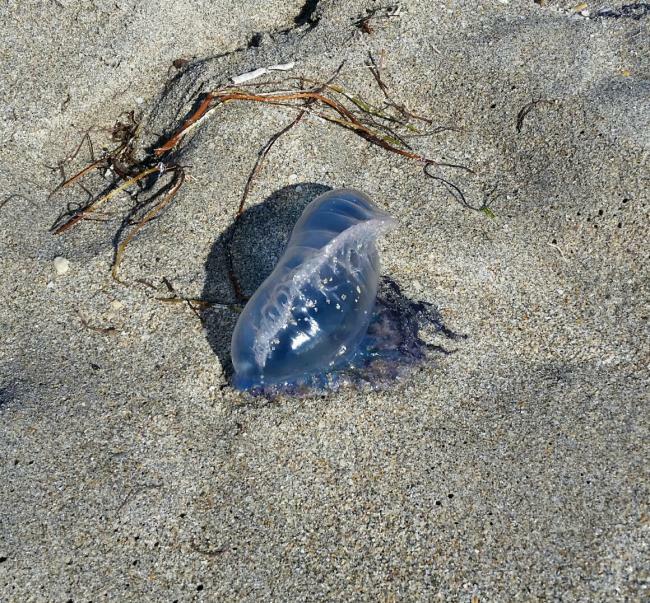 Portugese Man-o-war are everywhere when the water temperature cools off. An on-shore breeze for a training swim or a race means certain doom. If those aren't bad enough for you, we have the lovely pink Cassiopeia jellies that only sting from the bottom side of the Manowar are a 10, these little bastards are only about a 5. However, they continually belch out their little offspring known as "sea lice". When they bloom under your skin, your almost guaranteed to fall asleep at work from the bottle of Benadryl you picked up at CVS on your way in to the office. Make sure to check with the beach patrol before you jump in to show off your mighty open water prowess. Don't even get in if the wind is is blowing onshore. The beach patrol won't have any problems locating your screaming body with 20 feet of tentacles wrapped around your head possibly scarring you for the rest of your life. In addition, if your allergic to bee stings, these fu€Kers would love the chance to end your life. I've had four very bad Manowar stings in my life. They are more vivid to me than watching my kids being born or getting married. That's how bad they are (or it highlights my lack of spark in being a spouse and/or a parent). Here's proof of man o' war. Taken two days ago in Boca Raton, FL. Water temperature 73F (22.8C) and chock full of these critters. Needless to say, no ocean swimming possible. My entire post just disappeared, so I'll keep it short. Blue Mermaid's picture is a good representation of a MOW on the beach. You'll notice that the tentacles seem short. They can often grow in excess of 20 feet. They can break off in the surf or any other reason a a becoming impossible to see. These are the ones that can wrap around you, and can cause lots of problems getting them off. They're hard to get a hold off and are pretty slippery. The only "safe place" to pick them up is by Rippled spine. They're bad news and never a good idea to swim with them. I've done a few races under threat of these things and I recall a swimmer swimming with an epi-pen up in his cap or suit. I was with a group doing a training swim in the Gulf of Mexico prior to a half-iron distance event. One of the group members was arguably the toughest lady I've ever met. We were working on surf entries and exits, and at the end of the time.... she called out, "someone lost their Nerf* ball!" I had already exited the water, but as she started swimming toward it, there was this odd.......... "voice" in my head (I promise I"m not making this up) that just said "NO NO NO NO!" But, she was too far to hear me say anything, and I was stunned. Turns out, the "Nerf ball" was a MOW, and she got hit by it. I've not heard that type of yelling before, and I swear she swam so fast back to the beach she was nearly walking on water. It drove her to her knees. To make a potentially long story short........ she raced the next day............and was top 10 in her age group....still with weals on her arms from her encounter. She is one tough lady! *Nerf = spongy ball, many times shaped like American football -- floats, and if you get hit in the head with it (esp. at the beach), it doesn't hurt quite so badly. Many kids have a Nerf style ball before a "regular" ball because they're squishy enough to easily grip. I have been stung by a man-o-war, and just saw one on the beach in Miami. Worst pain I have ever had. Never again. there ought to be an "Amen Sistah!!" emoji.....because,............. "Amen Sistah!!!" USMS allows boat resting on open water swimsThis discussion was created from comments split from: USMS OW SANCTIONING.